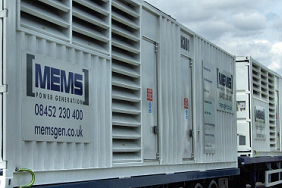 Leading Hire company MEMS Power Generation have placed a further order with ADE; this time for 40ft containers to house 1250KVA Cummins machines. 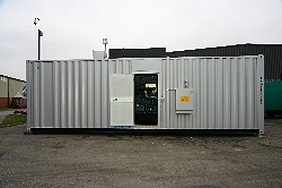 Again, the design brief was to satisfy all the engineered requirements of a rental container:- Rugged durability attained with high quality materials and workmanship; ease of use by designing practical features to promote simple operation, serviceability and deployment to site. Asked why MEMS selected ADE for this project, Paul Knight, Procurement Director reported 'MEMS often has to provide goods and services in a reactive environment, and we expect the same of our suppliers. In this instance ADE were able to take a concept through to final design in a short space of time.In doing so, MEMS are able to ensure that the product will be available to our customers in the quickest time possible'. 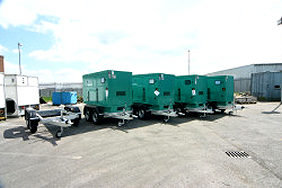 Cummins Power Generation place orders for 5 trailer mounted units, the generator sets were free issued to us by Cummins. All we had to do was install the gen-sets onto the trailers and get them shipped within a very short lead time. A nice easy job! 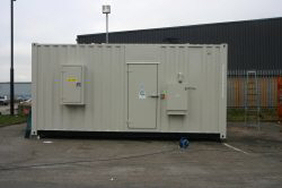 St Georges Hospital take delivery of a 350kVA unit mounted inside a 30ft container. Features include:- Sound attenuation to 65dBA at 1 meter, roof mounted cable entry, an external fuel filling cabinet, 2 x oil filled heaters and a 2,860 Litre base tank. Watertech in Trinidad place order for a 939kVA Cummins QST30G3 set enclosed in a 40ft ISO container sound attenuated to 85dBA@1 metre. Includes a 1,000 Gallon tank. This generator also had motorized louvres at each end which close off and restrict oxygen to the inside area in the case of a fire warning. Asda Teesport consisted of a 1250kVA Cummins KTA50G3 engine with a Newage P7B alternator, Contained inside a 20ft ISO container sound attenuated to 85dBA@1m. 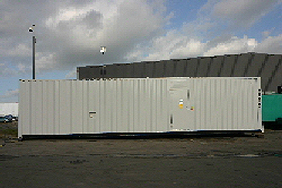 This package also included a 2,050 Litre Bunded bulk fuel tank with a fuel fill point on the outside of the container.